Complete this form to list a single vessel. To list more than one, please email or call us at (360) 678-8880. Since our first sale in 1983, Marcon has sold/chartered over 1,475 vessels and barges between companies located in the U.S. and worldwide. While we specialize in the towing, marine construction and offshore petroleum industries, we handle a variety of vessels and barges. Besides our primary focus in the sale, purchase and charter markets, we have assisted many companies in evaluating capital acquisitions and market rates. Give us a call. Our brokers and staff will be happy to help you. Search Vessel Listings and Search Barge Listings links to the left allow you to use customizable or quick date searches. From the results, you can select listings to view their details. For more information on a listing, please select E-mail Marcon About This Listing from the upper right corner of the listing page. If you already have Marcon's file number, you can input that into the Search box to go to the file's listing page. Recent Flyers contains all flyers Marcon has sent out by email and mail over the past 60 days. The flyers are based upon equipment types, such as supply or tug, or equipment related to specific company types, such as construction or oil. If you wish to be added to our mailing lists, please email or call us. 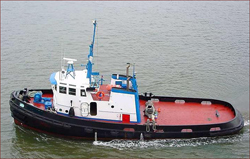 March 18, 2019 -Kirby Offshore Marine Pacific, LLC has sold its 3,900BHP twin screw ocean towing tug "Sea Hawk" to private US interests for continued service on the US West Coast. March 7, 2019 - Manson Construction sold two of their steel flat deck barges, the "Manson 72" and "Manson 74", to private West Coast tug and barge operators. March 7, 2019 - A 100.0' x 40' x 5' depth, inland spud barge built by Robishaw Engineering of Houston, Texas in 2014 was sold by an East Coast construction company to private West Coast buyers. Every year, Marcon publishes periodic Market Reports on the crew boat, inland river pushboat, supply, tank barge and tug markets; a monthly Bunker Price History summary; and three Newsletters, each containing an article and about 750 listings. Under World News > News Articles, Marcon provides current industry news, including: Baker Hughes Rig Counts; Short Term Energy Outlook; This Week in Petroleum; and U.S. Coast Guard News.